Wood fencing is a strong, secure option that provides timeless beauty to any application. You can choose from any number of wood fencing styles, from picket, post and rail, privacy, and others, to compliment your landscape. 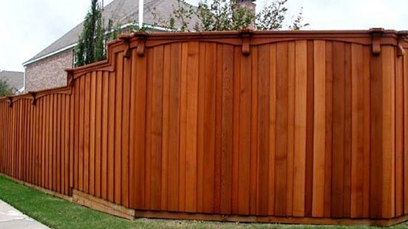 Additionally, Upchurch Fence Company has an extensive selection of wood accent pieces custom designed, the perfect finish to any installation. At Upchurch Fence Company, we are experts in designing and installing wood fences in the McDonough and surrounding areas. 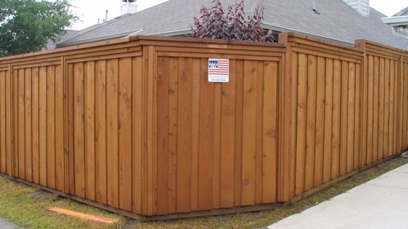 Redwood, Cedar or pressure treated pine, 6' high privacy fence with 1"x 6" boards, is the most popular enclosure for residential backyards and subdivision fencing. Basic dog ear fences, positive or negative scalloped fences, capped privacy with or without lattice toppers, all serve to provide privacy and security with varying degrees of decorative flair. 8' high is also available for maximum privacy or commercial applications, such as dumpster enclosures. Shadowbox and colonial style fence provide good alternatives when total privacy is not as important. From posts to rails, to boards and nails, only quality fence material is used. Projects are constructed on site by experienced installers to provide the optimum in quality wood fence installation and repair.